14 Market Square consists of two separate but interconnected buildings: the large 3-storey shop (best known as Turnham's or The Grapevine) on the corner next to The George in the centre of the photo above, and the adjacent 4-storey building, The Bakery from the 1950s-80s, now numbered 14C. The latter is described in its listing report as "early C19" but in fact it was "newly built" in 1882, in an unusual mock-Georgian style. The large shop is listed as "Mid-late C18" but according to Alan Wigley (A Window on Winslow, p.27) "the rendering covers Tudor framing and brickwork". 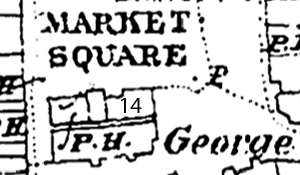 The east end of 12 Market Square appears to have been truncated, and it seems likely that part of it was separated during the 18th century, attached to no.14, then demolished and replaced with the 4-storey building. Along with The George, these shops form an early encroachment into the open space of the original Market Square. Joseph Glenister inherited from his father Francis Glenister, mercer "a shop containing 1 bay in the Market Place". 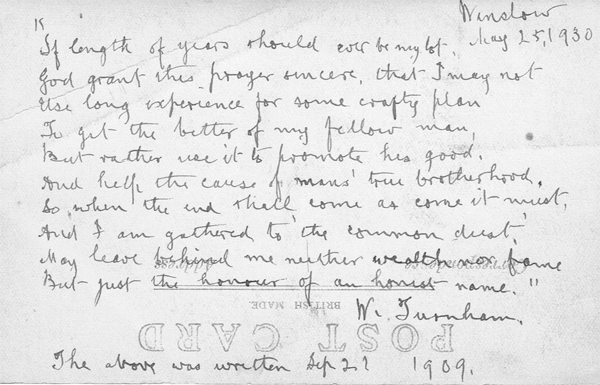 "concerning All that Mesuage or Tenement in Winslowe aforesaid wherein I now Dwell I Give Devise and Bequeath the same unto my loving wife Jane and her heires forever"
Ann wife of William Hobbs sought to be admitted to a messuage in Winslowe which came into the lord's hands on the death of Jane Glenester widow [her mother] presented at the court on 21 Oct 1724. Rent [blank], fine 5s. "I give and devise unto my said wife Mary Bowler all that my copyhold messuage or tenement situate and being in the Market Square of Winslow aforesaid with the appurtenances thereunto belonging now in the tenure or occupation of Sarah Foster spinster ... to hold the same unto and to the use of my said wife Mary Bowler and her assigns for and during her natural life and from and immediately after her decease I give and devise the said messuage or tenement ... to the use of my son Charles Bowler his heirs and assigns for ever." 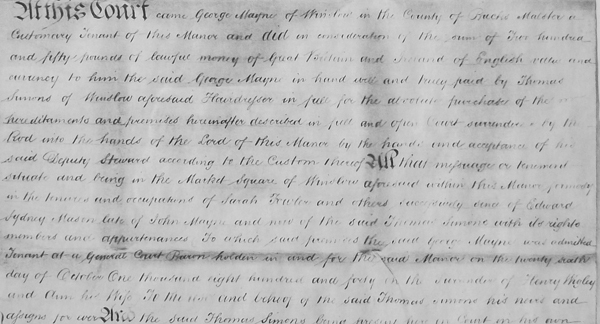 Thomas Bowler sr of Winslow wheelwright whilst he lived held a messuage in the Market Square formerly in the occupation of Sarah Foster spinster, now of John Cheney ... By his will dated 6 May 1779 he devised them to his wife Mary for her life, then to his son Charles Bowler. Mary is since dead, Charles desires to be admitted tenant. Rent [blank], fine 9s. Immediately after Charles Bowler of Aylesbury currier & Elizabeth his wife surrendered to the use of Alexander Norton jr of Buckingham tanner. Rent [blank], fine 14s. On Thursday the 31st Day of October, 1811, at the Bell Inn, Winslow Bucks, (punctually at Six o’Clock in the Evening), under such Conditions as shall then be produced, viz. A Substantial well-built Brick and Tiled MESSUAGE, or TENEMENT, advantageously situated for Trade, in the MARKET-SQUARE, WINSLOW aforesaid; comprising an Entrance-passage in front, on the Right a Neat Parlour, on the Left a good Shop, with Bow-window, three Bed-Chambers, two Garrets, excellent Kitchen, in which is a good Pump, and plenty of Water, back Kitchen or Scullery, Beer and Coal Cellars, and suitable Offices, now in the Occupation of the Proprietor. The above Estate is in complete Repair (Copyhold of Inheritance, held of the Manor of Winslow aforesaid, subject to Quit Rent, 3d. Herriot when it happens, Fine 6s. Land-Tax 3s 6d) and a desirable situation for a small genteel Family, or a person wishing immediately to enter into Business, as an early Possession may be had. For further Particulars, enquire of Messrs. WYATT & WILLIS, Solicitors, Winslow, Bucks, who will send a Person to shew the Premises. Particulars also may be known of the Auctioneer, Aylesbury, Bucks. A Convenient HOUSE and SHOP, centrical [sic] Situation, pleasantly situated in the MARKET PLACE, WINSLOW, Bucks. The Premises possess an excellent Shop, cheerful Sitting Room neatly fitted up, two airy Bed Rooms, two Attics, Kitchen, with a Pump of fine Water, and two Cellars. The Whole is in excellent Repair, (the Stock and Fixtures to be taken at a Valuation), in the Occupation of the Proprietor, who is retiring from Business. N.B. An excellent Situation for a Printer and Binder. Apply to Mr. STUBBINGS, as above, if by Letter, Post paid. On Thursday the 1st of April, 1813, and following day, on the Premises. THE STOCK in TRADE and other EFFECTS, of Mr H.W. STUBBINGS, Bookseller and Stationer, in the Market-Square, WINSLOW, who is retiring from Business; comprising a Numerous Assortment of Books of different Descriptions, several Articles in the Fancy Japan and Perfumery Line; also Household-Furniture; consisting of an Oak Bedstead, and Flock Bed, capital Oak Dining-Table, Mahogany Dinner Tray and Waiter, Dresser and Shelves, a Counter, one Ditto complete, with Drawers, Glass Case, Pair of Venetian Blinds (equal to new), a Copper and Grate, with various Other Articles. The Whole of the above Stock is well worth the Attention of the Trade, which has been new within the last fifteen Months, and will be sold without Reserve. The sale will commence at Ten o’clock precisely. A Messuage or Tenement in the Market Square of Winslow formerly in the tenures or occupations of Sarah Fowler and John Cheney [grocer / ironmonger], since of William Seaton [cordwainer] and now of William Mayne. Mrs Whichello: house 5s 11d, exonerated. To HAIRDRESSERS, PERFUMERS, and OTHERS. HOUSE, SHOP AND PREMISES, (Well situated for Trade), WINSLOW, BUCKS. A Copyhold HOUSE and SHOP, situate on the MARKET SQUARE of Winslow, and facing the Turnpike Road, forming an excellent situation for any business requiring show. They have recently been fitted up very conveniently; a good business in Hairdressing and Perfumery has for several years been carried on in them, and there is no one of the same business in the town. The premises are nearly equal in value to freehold; they may be viewed, and further particulars known, on application to Messrs. WILLIS & Son, Solicitors, or the Auctioneers, Winslow. 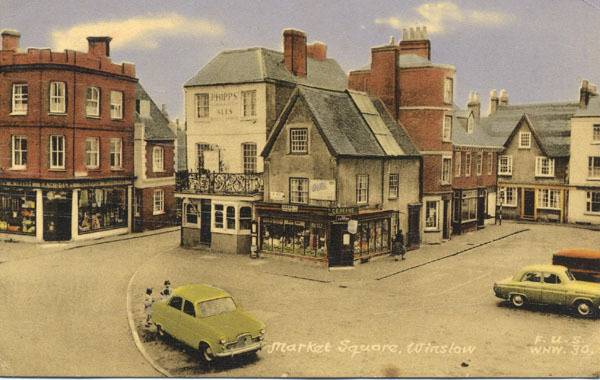 A Messuage or Tenement in the Market Square of Winslow, formerly in the tenures or occupations of Sarah Fowler and John Cheney, since of William Seaton William Mayne and George Bunce, successively late of the said Mary Mason, now of Edward Sidney Mason. Mary Mason, then Mary Whichello was admitted tenant at a General Court Baron on 30 Oct 1826 on the surrender of George Bunce. To the use of Henry Wigley and Ann his wife for their joint lives and the life of the longer liver, then to the heirs and assigns of Henry Wigley, subject to the Conditional Surrender to Charles Willis and the money and interest due. At this court Henry and Ann Wigley were admitted tenants. Yearly rent 4d. Fine 10s. Fealty respited. To which George Mayne was admitted tenant at a General Court Baron on 26 Oct 1840 on the surrender of Henry Wigley and Ann his wife. To the use of Thomas Simons, who was admitted tenant. Yearly rent: 4d. Fine: 5s. Fealty respited. 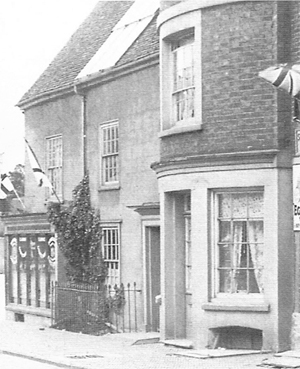 The separate property next door now seems to have disappeared, and there is no entry for it in the later censuses, but Mr Simons rebuilt it as a shop with living accommodation. Hotel, Winslow, at Six o’clock in the afternoon. The property comprises a brick and slated house most eligibly situate in the Market Square, Winslow, adjoining the “The George” Hotel, and containing - Shop with 2 front windows, good Sitting-room over, a large Bedroom and 2 other Bedrooms on second floor. An underground Kitchen opening through archway to cellar extending under the Market Square from which there is an entrance. For further particulars apply to Messrs. Willis and Willis, Solicitors, Winslow, or to George Wigley, Auctioneer and Land Agent, Winslow, and Town Hall Offices, Fenny Stratford. On FRIDAY, September 15, 1882, at the Bell Hotel, Winslow, at Five o’clock in the afternoon, by direction of Mr. Thomas Simons, who is leaving the town. The Property comprises a brick and tiled House containing a large Shop with double front of 152 feet plate glass, a back Shop or Sitting Room, 2 good Sitting Rooms, on first floor and 2 Bedrooms on second floor; underground kitchen, cellar and coal cellar and a good well of water. It is Copyhold of the Manor of Winlow [sic], but nearly equal in value to Freehold, and is Land-tax redeemed. List of fixtures drawn up by Wigleys on 15 Sep includes: Front shop, second shop, kitchen, back sitting room, front sitting room, back bedroom, front bedroom. 18 Nov: receipt for £28 14s 9d "balance due on sales of property stock in trade & c.", signed Thomas Simons. WRITING and Bill Papers, Envelopes, Pocket Books, Pencil-cases, Portrait and Scrap Albums, Drawing Papers, Card-boards, Camel Hair Pencils, Slates, Sponges, Pencils, Penholders, Several Volumes of Books, Magazines, 9 years of Punch (unbound), Work-Boxes, Writing Desks, Satchels, Valentines, Embroidery Work and Cotton, Wool Work Mats and Braid, Clothes, Hair, Nail, and Tooth Brushes, Hair Combs, Fire Stove Ornaments, Brooches, Studs & Solitaires and Laces, Bobbin Wire. A large assortment of Toys, quantity of Fishing Rods and Tackle, Walking Sticks, Cricket Sets, Pipes and Cigar-holders, Concertinas, Draught-boards and Draughts, Dominoes, several Glass Cases, 25 Bird-Cages, a large Canary Aviary, Brass circular Parrot Cage, a few lots of HOUSEHOLD FURNITURE, Mahogany Press Bedstead, Papier-machie Tables, Reading Lamp, Music Stand, Experimental Still, Library Stove, 3 Liquor Decanters and Labels, Pier Glasses, several vases of wax Flowers and Fruit under glass shades, quantity of Flower Pots, &c., &c.
On TUESDAY, October 17th, 1882, on the premises at the Market Square, Winslow, by direction of Mr. Thomas Simons, who has left the Town. All that messuage or tenement situate and being in the Market Square of Winslow aforesaid within the said manor formerly in the tenures and occupations of Sarah Fowler and others, successively since of Edward Sydney Mason, late of John Mayne, now of the said Thomas Simons. F.J. Munt, Jeweller, Castle Street, Buckingham, Has now arranged to Receive Watches and Jewellery for Repairs, &c., at Mr. W. Turnham's, Confectioner, Market Place, Winslow, every Wednesday Between the Hours of 11 and 6 o'clock. William Turnham was born in 1850 in Sheep Street. 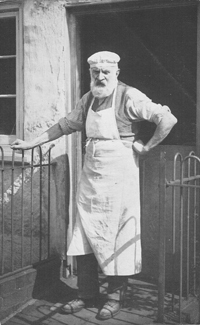 His father John took over the Bakery at 10 Horn Street in 1866. 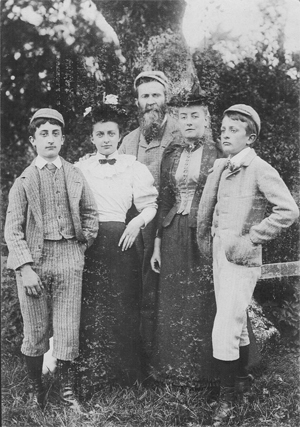 William went to school at Grace’s Academy where he was a contemporary of the future playwright Henry Arthur Jones. 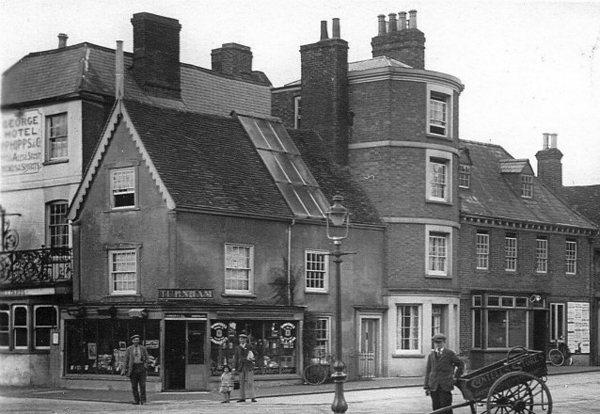 William and his wife Mary lived at 14 Market Square, which they ran as a confectioner's shop, and inherited the bakery business when John Turnham died in 1894. 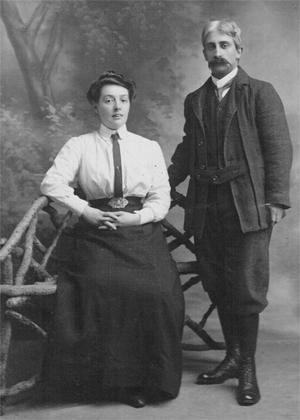 Their son Harry then had his photography studio at 14 Market Square, and Harry's wife Hetty ran the confectioner's. William was an active Liberal and Congregationalist, a member of the Bucks Volunteers and won many trophies for rifle-shooting. He was best known for his poetry about Winslow, and in 1932 published Turnham's All Sorts. A copy of this is on display in the Winslow: Medieval to Modern exhibition at the Old Gaol, Buckingham, until 31 March. Click on the image on the left to see a poem which he wrote in 1909, copied out in his own writing. Thanks to Ed Grimsdale for some of the information above. William Turnham in the shop doorway with his wife and daughter. A painting of 1860 (Alan Wigley, A Window on Winslow, p.26) shows that the door was previously on the left, next to The George. Mr. W. Turnham, who has succeeded to the poetic mantle at one time worn by the late Mr. Henry Wigley, at Winslow, entertained a large number of people at the Congregational Schoolroom there last week by giving selections from his compositions, some of which have appeared in London magazines. His themes were varied, ranging from Spelling-bees to Fire Brigades and Rifle Corps of the past, down to the New Woman of today; with other pieces, both grave and gay. They certainly were very much appreciated by the audience, the Chairman remarking that he had seen plenty of published pieces which were not equal to Mr. Turnham’s. I note, by the way, that one of Mr. Turnham’s ancestors was residing at Buckingham as early as 1676, when a John Turnham sold 9 acres of arable land situate in Churchway Furlong to the trustees for the endowment of Buckingham Vicarage. Thomas Turnham, too, was Mayor of Buckingham in 1720 and again in 1726. William Turnham had now moved to 10 Horn Street, replacing his father who died in 1894. Well known as the Winslow Poet, he died in 1937 aged 87. According to Alan Wigley (A Window on Winslow, p.28), the 4-storey building was in use as the Town Library and reading room. 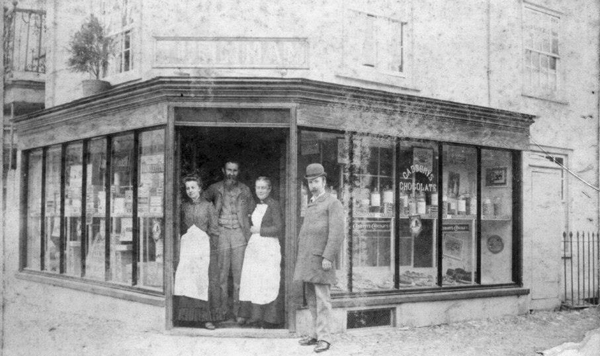 The confectioner's business was run until the 1960s by Harry Turnham's niece Mollie and her husband Charles Beane, whose name is over the door in the photo at the top of the page. It later became The Grapevine off-licence. It is currently (February 2016) Guelder Rose. 14C was run as the retail shop for the bakery (originally Turnham's) at 10 Horn Street until the 1980s.